little bee books, 9781499802382, 40pp. Step right up and read about the debut of cotton candy at the St. Louis World's Fair in 1904! The 1904 World's Fair in St. Louis, Missouri, was an exhibition like none other. It had huge buildings for displaying all sorts of inventions and machines, exhibits from all around the world, and vendors selling new foods, including something called Fairy Floss, which we now call cotton candy. 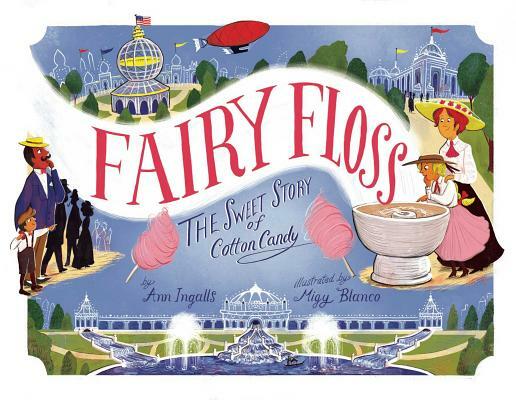 In this book, a young girl named Lily and her Aunt Mae are told all about Fairy Floss by John Wharton, one of the inventors. Lily can't wait to go to the Fair and see how it's made. While there, she even makes a batch for herself! Readers will get a glimpse of the excitement and innovation of the Fair through the descriptive text and the detailed illustrations in this beautiful historical fiction picture book.